As part of an exchange, a friend once asked me to weave some trim based around Rarity from Hasbro's My Little Pony: Friendship Is Magic. I chose to go with Rarity's cutie mark, elongated pale blue diamonds on a white background and added borders of purple to represent her mane. To make the diamonds elongated, I offset the turning reversals by one pick. I started off using a purple weft, but it showed through the white yarn of the main pattern too much, so I swapped it to a white weft. To avoid white weft spots against a purple selvedge, I used a white floating selvedge (an extra piece of yarn not controlled by the tablets which the shuttle went over on the way into the shed and under on the way out of the shed). 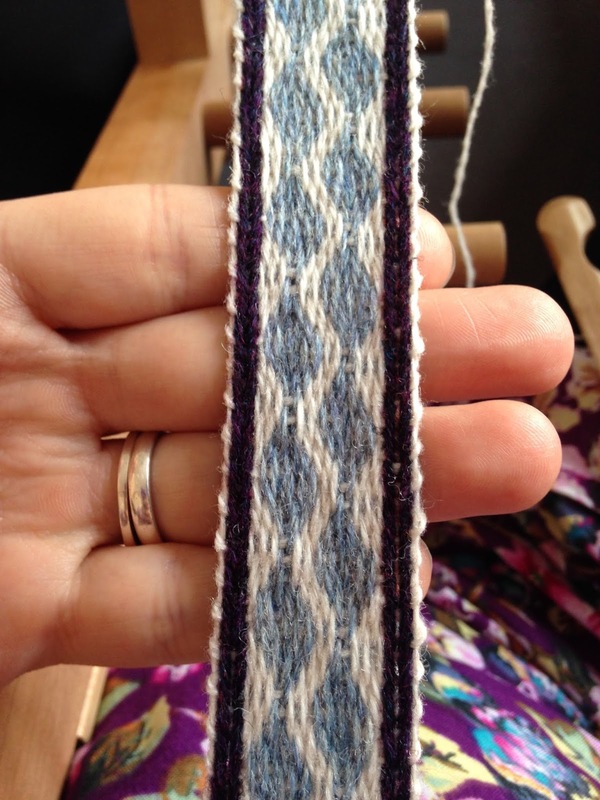 If I wove it again, I would add an extra tablet on each side of the selvedge, carrying all white yarns. I would place this band's difficulty level at advanced beginner/ intermediate. 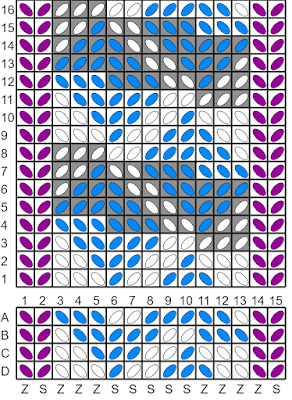 The pattern repeat is in multiples of 8 picks. Thread your tablets as above.